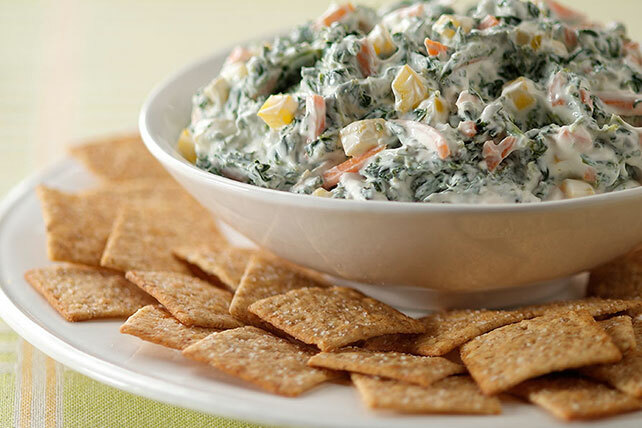 Even people who don't like spinach tend to like spinach dip. Wonder if that's because they like ranch dressing more than they dislike the veggie? Mix sour cream and dressing in medium bowl until well blended. Prepare using reduced-fat thin wheat snack crackers. This fresh-tasting dip can be made with red or orange peppers instead of the yellow peppers. Dip can be made ahead of time. Refrigerate until ready to serve.